Nestled in the beating heart of Shepherds Bush, Bushstock 2018 has returned with a vengeance. The music festivals reputation for the 'next big thing' is notorious to those within the industry but this year it truly felt like the news had made it's way into the the public domain. Admittedly the line up was full of stellar acts, as usual, but every venue I visited was full to the brim with people, whether it was for the festival opener Angie McMahon in The Library, Adam French at The Courtyard or Flyte at Bush Hall. Bushstock 2018 was a joy to capture. For those who got down early made their way to The Library where Australian solo artist Angie MacMahon charmed us all with her anguish laden power vocals and striking guitar chords. There was a beautiful chilled vibe as the audience choose to sit on the floor. Angie MacMahon well suited to get the festival started. Opening The Courtyard stage was the fabulous indie-pop artist The Beach. A strong turn out by the crowd saw frontman George Morgan performing stripped back acoustic versions of his songs. Even though these songs deserve to be played with the full backing of a band, they are still enjoyable and George was really interactive with the crowd. He made sure to visit the bar after his performance and hang out with everyone. Next time I see The Beach I want George to bring the rest of the band so the full depth and power of the songs can be felt. Two o'clock saw a secret set at The Albertine Wine Bar by Gengahr. Announced only an hour before their set, the eagle-eyed social media watchers had all ready filled out the venue 30 minutes before the band were due, so sadly, I did not make it in, but Gengahr would have been a right treat to have witnessed in a 50 capacity venue. So instead I headed over to the rather more spacious St. Stephens Church to check out Swedish singer Nadia Nair. I was newcomer to Nadia's music, having only given her a brief listen the day before, but it was enough to intrigue me and Nadia didn't disappoint. She is a classic example of an artist on the rise and once again the venue was filling up nicely. St. Stephens Church was the perfect venue for Nadia's music, she has a Kate Bush vibe to her style and her music is a beautiful blend of smooth electro-pop and ethereal vocals. Nadia uses her music to voice the struggles she has faced over the years with her identity and sense of place which came about by being mixed race in a predominantly white country. Her lyrics are poetic, not preachy and accompanied by only two musicians, Nadia gave a powerful performance. Back over at the courtyard is one of the countries finest singer-songwriters, Adam French. With a hauntingly beautiful voice, emotionally charged lyrics and the full band behind him, his performance was my highlight of the festival. Adam is one of those artists who looks like he was born with a guitar in his arms. He was made for the stage and The Courtyard was packed out for him. The crowd joined in in singing along to the final song of the set “Weightless” after which Adam stayed around to greet people and even checked out Stereo Honey's set who took to the stage after him. Sadly The Courtyard was running a little behind schedule so I didn't have time to stay for Stereo Honey as I had a date with Only The Poets over at Defectors Weld. The energetic indie-pop quartet have just had a new line-up so I was excited to see how they handled themselves, and as I had expected, they were faultless! The new members have instantly gelled and they put on a hell of a show on the tiny pub stage. The place was full to the brim. Only The Poets have a very loyal fan base who frequent many of their shows and Bushstock was no different. Frontman Tom proclaimed that this would be the last time you would see the band play in a London pub and I can't disagree. If you're after a gig full of energy and plenty of songs to dance, sing and mosh along to then Only the Poets have got you covered. The next artist on my schedule was the elegantly beautiful Freya Ridings. Freya is on the road in October for a UK tour which will see her return to Shepherds Bush to play the Empire so I had to make a stop at St. Stephens Church to see what she has to offer. The pews were filled, as were the aisles and the set was timed perfectly as the summer sun was starting to drop which meant there was a beautiful light filling in through the glorious stained glass window at the back of the stage. Freya not only looked angelic and befitting of any church, but so did her voice. Her voice has a lot of age and soul to it and it's hard to not be moved by her set. For thirty minutes, St. Stephens Church sat in silence while they witnessed something truly beautiful. The night was starting to reach its end and I took up position at Bush Hall for my final three acts of the night. First was the utterly brilliant, mesmerising and surprisingly witty Tors. They are a band who's name had kept crossing my path but I never pursued them until I was researching the acts on the line up and straight away I knew the folk-pop trio had to be on my list. Not only was their set pretty upbeat and full of joy and superb guitar playing, but the performance really is all about those stunning harmonies. I honestly could have been serenaded by these guys all night. Next up, Sam Fender. Another emerging artist who's name is making big waves in the industry. 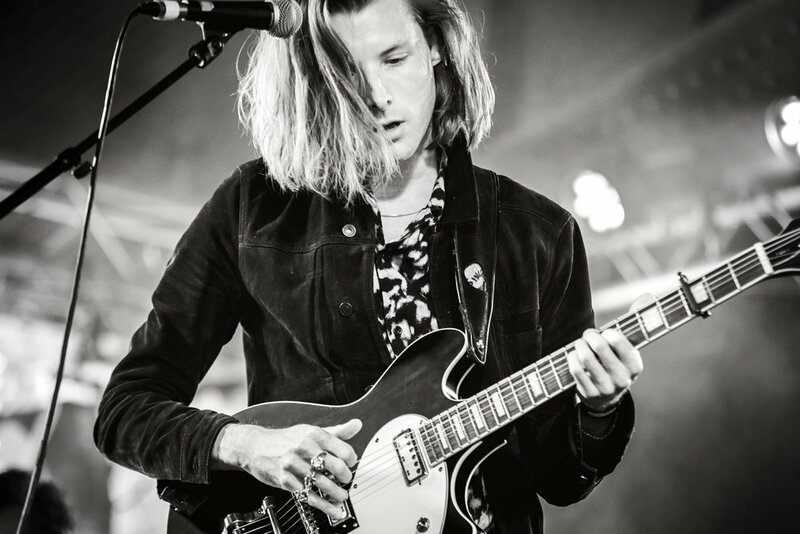 He steps out onto the stage which is adorned with guitars as he and his band entertain the crowd with fiery guitar hooks and Sam's voice which sounds like it should be coming from someone much older. He has a great powerful and emotive voice with hints of American blues and the set covers both gentle, soulful, acoustic ballads like “Leave Fast”, to full on star making rock songs like “Play God”. The final act tonight on the Bush Hall stage, and in fact the closing act of the festival, is FLYTE. Their nostalgic blend of psychedelic indie-pop is just what I was in need of after a long and hectic day. What I love most about this band is how effortless it all feels. They famously don't advocate the use of backing tracks and so their live shows are just as good as their recorded material. Their blend of vocals just fills you with euphoria, it's hard not to fall in love with this band. There is a mix of slow numbers like “Archie, Marry Me” and the tranquil “Orphans Of The Storm” where the room just fell silent. “Cathy Come Home” and “Faithless” were the final songs of the night and both got the crowd singing, hand-clapping and dancing along. There was a rather impromptu encore which the majority of the crowd was not anticipating, so sadly a fair few had started to head home but FLYTE loved every minute of their evening. They continue to play the festival circuit so if they pop up in any of your line-ups, I urge you to check them out. Bushstock 2018 was once again a terrific effort. The artists were well selected with a great variety, which sadly meant I didn't get to see Grace Carter, Stereo Honey, Lilly Moore, Hollow Coves, Feet, King No-One, Matt Woods or the breathtaking Aurora. But still, we can't always get what we want and I was very happy with what I did get. So a big thank you to everyone involved in what was another year to remember.